Depending on the chosen measurement marker, free improvisation in its modern Western guise is now well over half-century extant as a means of musical inquiry. That longevity means that the days when pairings of instruments were considered radical or ungainly purely on the absence of measurable precedence are long gone. The tandem of trombone and drum kit may not be common, but examples are readily procurable. 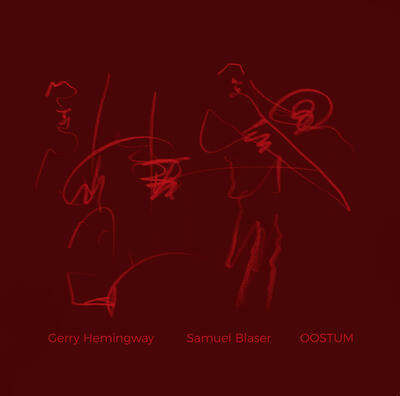 What remains singular is the pairing of Samuel Blaser and Gerry Hemingway with such instrumentation. OOSTUM documents on vinyl a concert between the Swiss and the American at Groningen, Netherlands in the summer of 2015. Six pieces, three to a side, serve as chapters in the amicable colloquy. The duo starts from near silence and the dynamics remain wide for the duration with Blaser tracing thematic fragments against a gliding wash of colors and textures from Hemingway. Bowed cymbals match and contrast with the metallics of plungered brass to build a striated horizontal structure of drones. Soon after, it’s mallets on toms vying with pursed, slide-driven murmurs in a loping processional. It being Blaser, there’s also a fair bit of humor as with the Doppler gutbucket shenanigans that color the Side A-closing “Balloon”. Instruments and their implementers prove an optimal match.